The site: Yorktown, Virginia. The mystery: Whose arms were on the British mortars besides those of the King? As I said, I took photographs of the mortars and of each of the coats of arms, copied them to my netbook, attached my external hard drive with a number of armorials, ordinaries, and other heraldic reference books on it, and went to see if I could solve the mystery. First stop, of course, was Papworth's Ordinary of British Armorials. The pronomial coat, in the first and fourth quarters, appeared to be a fess of three lozenges or fusils within a bordure. Papworth had a couple of different blazons that described these arms (Argent, three lozenges conjoined in fess ... and Argent three fusils in fess gules, a bordure sable), all ascribed to one or another Montagu/Montague. 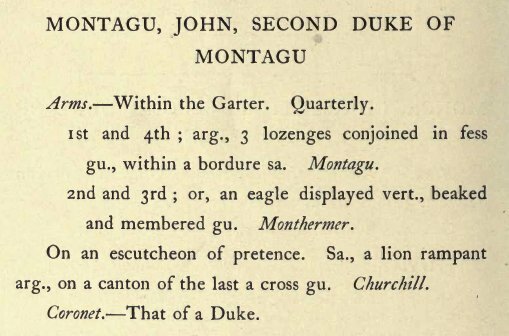 Opening Fairbairn's Crests and double-checking the motto, I found Spectemur agendo (Let us be judged by our actions) used by Montagu. Finally, a little serendipity occurred. 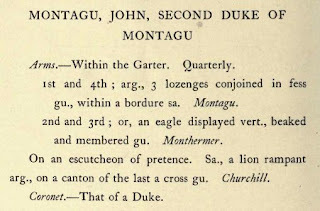 I was at the time reading the book I told you about in an earlier post, English Heraldic Book-Stamps, and just happened across the entry entitled "Montagu, John, Second Duke of Montagu". 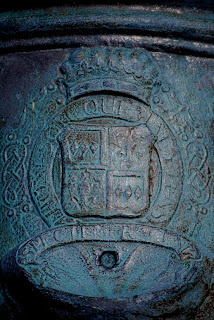 The entry gave not only the blazon of his arms (including an inescutcheon of Churchill, and went on to explain why the Churchill escutcheon of pretense appeared there), but also told me the reason his arms would have appeared on the mortar! 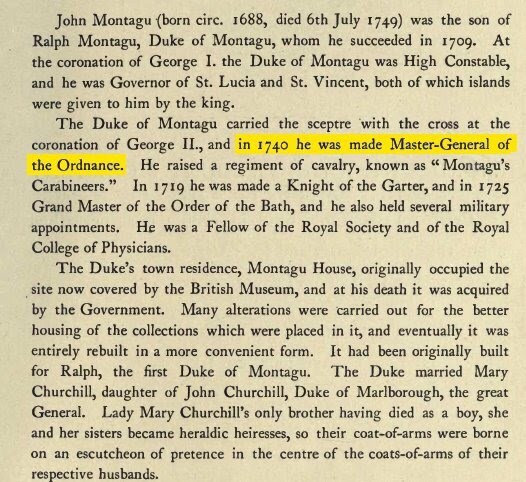 As you can see, John Montagu, Second Duke of Montagu, was made Master-General of the Ordnance (which would have included cannon and mortars) in 1740 by King George II. So, mystery solved! With the help of a little modern technology (and the internet) and some fortuitous serendipity, we not only know whose arms appear on the British mortars at Yorktown, but why. 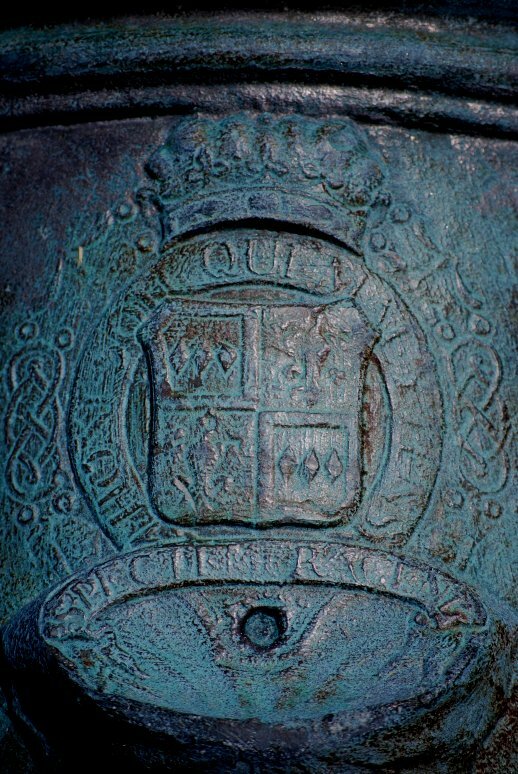 There's another cannon from this period (with the arms of the Duke of Montagu) in the Citadel, in Haiti. Shame you can't attach photos to comments as I do have a photo of it and it's clearer than the one above. Would be interesting to know how it ended up in the Citadel!